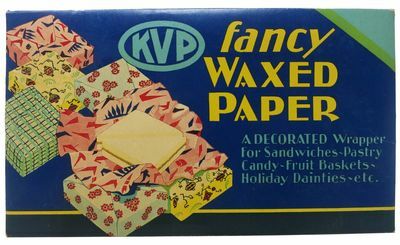 Kalamazoo, Michigan: KVP Company, 1931. 1st printing thus. Housed in the manufactor's portfolio. Some sheets beginning to adhere to each other, though can be separated by peeling. Overall, Very Good.. Goodly number of sheets still present, all gayly colored in green, orange, blue, white floral design. Portfolio: 6-5/8" x 11-1/2". Sheet of Waxed paper: 13" x 11"